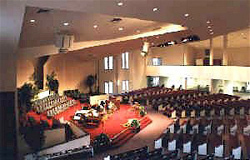 Phillips Pro Systems provides audio sound systems for churches, schools, restaurants, theaters, auditoriums, and all other facilities. This 2,500-seat sanctuary is a good example of a modern design/build project. Recently completed on time and on budget for a large Southern Baptist congregation, the sound and lighting systems in this busy facilitity are ready to handle a wide variety of media activities: worship, lecture, theatrical and musical performances, and broadcast ministry. A 40-channel house mixing console is only one leg of a 3-way splitter system that allows simultaneous live performance, recording, and broadcasting — all with independent mixing control of 48 discrete channels. 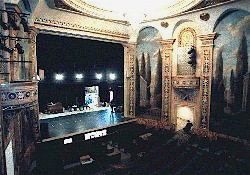 The Ritz Theater was a $4 million dollar renovation project of an older, but still glamorous downtown theater. As you can see from the photo, aesthetics and sound coverage was a real issue, along with fulfilling all rigors of the riders for touring groups. A forty-channel console was a must. Incorporated into the sound system is an additional Pro-Logic surround sound processor, installed for full viewing of motion picture format (complete patch throughout).For pleasing sound, and a great view, this is our theater of choice. When World Class Corporate board rooms come to mind, think Phillips Pro Systems, LLC. We provide state-of-the-art equipment and ease of control. 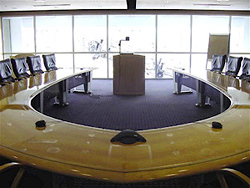 Board rooms are not just about audio & video systems any longer. They also include lighting and acoustical considerations. PPS has the experience to control the entire system with easy-to-use touch control. 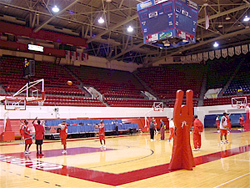 Phillips Pro Systems specializes in large-scale athletic facilities. We use the latest in modeling software to calculate sound coverage and intelligibility in the design phase. When intelligibility of speech is crucial, PPS is your first choice. 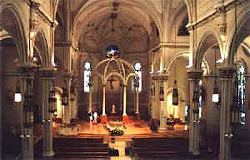 The St. John’s Catholic Church, as you can see, is a beautiful display of architecture. You don’t see a building like this everyday. With this beautiful architecture comes many hard surfaces, creating long reverberation times, ultimately reducing intelligibility. 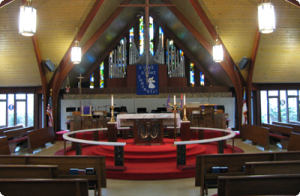 We solved this problem by using a delayed speaker system, giving complete coverage, while at the same time maintaining a constant volume level throughout the sanctuary. Two-point sources were used to give the listener a realistic experience of where the sound comes from. With our help, St. John’s now has a sound system to match the wonderful architecture.